In the segments here, multiple, mechanically designed instruments, like something out of a sci-fi movie, spring to automated life playing music. Almost hypnotically, the videos undoubtedly will draw almost anyone into them. You'll want to spy just how a certain instrument functions, or how realistically it vibrates or operates. The little details pile up to a bewildering technical achievement. These seven songs may only last about 30 minutes, but the artistic work undoubtedly fills them the time nicely. I will admit, however, the music was not particularly to my taste. That's really an individual issue, though, and no matter what the style or genre of the music, this animation would still be extremely entertaining. Of course, probably the most famous of the works on this disc is the entrancing Pipe Dream, often found playing in demo kiosks at PC stores and now packaged as a demo video with certain graphics cards and animation software. Admittedly, it is a memorable piece of work in which pipes shoot silver balls at strings and drum kits to create the music, with a complexity that is mindblowing. Another favorite of mine on this disc is Drum Machine; a clever play-on-words in which a giant, clockwork machine drives a dozen or so drumsticks with amazingly realistic physics and movement. You'd almost swear it was a real, robotic creation. Not all the work is noisy and brash, a good example being the calm and idyllic Acoustic Curves in which stringed instruments play themselves while hovering in mid-air. Indeed, there is a fractal-style beauty to the technological monster unleashed here. Image Transfer Review: The disc runs at a constant 10mbps bitrate with, according to the creators, as little compression as possible involved. So visually, we get a near flawless image in which digital issues just don't exist. The only problem is that the clarity and overall sharpness leads to rainbow patterns and dot-crawl in certain places. This is probably a television-related issue, more so than the disc, but it is an issue for those with less complex sets. Audio Transfer Review: The stereo audio is expressive and pretty much what you'd want from a music-oriented disc. All of the highs, lows, and in-betweens are handled extremely well in a very loud, effective track. No hiss or distortions are present, and I especially liked the inclusions of very subtle mechanical sound effects for the instruments activating or moving into position. Extras Review: From the beginning, Animusic is set up with one of the best, most functional menus I've ever seen, allowing quick access to everything the disc has to offer without any complexities or animations. Each of the seven videos can be watched separately, as one film, or in a continuous loop. After you're done with that, each video also has a multi-angle mode which, when activated, assigns 3 different "areas" or instruments to different angles allowing you to view any instrument you want with no camera panning at all, so if you like a particular instrument, you can study it as long as you want. Then, each video also has accompanying commentary by director Wayne Lytle. While the commentary is often a bit stiff and technical, it really has to be in order for the details to come across. 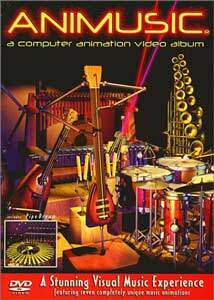 Still, it's an excellent supplement to understanding the approach to the project and the crossover MIDI-to-animation software developed for the disc. If that wasn't enough, you can then watch each segment as music-only, with the visuals replaced by schematics and early design renders, showing the evolution of the whole scene from idea to finished product. The disc claims 250 stills, and that feels about right. Even though the music is hit-and-miss, Animusic is still worth checking out by fans of computer animation and the interaction between audio and video software to create inter-dependent forms of art. The applications are enormous, and as I understand it, Wayne Lytle is already hard at work on Animusic 2. Should prove to be worth the wait.